The North American bison, Bison bison, is one of the largest wild cattle in the world. The species disappeared from the wild in the eighteenth century after extensive hunting for its meat and skin. The bison were once a key part of North America’s short-grass prairie ecosystem, and was a symbol of the wild west. The naturalist, Ernest Thompson Seton, estimated their numbers at sixty million at the times the first Europeans arrived in the new world. Bison live in herds of twenty to fifty animals. The cows lead a herd, normally members of a family. A bull can grow upto 6 feet high and weigh more than a tonne. The fur of a mature bull in winter is dark brown to black in colour. The length of the hair measures up to sixteen inches on the forehead, ten inches on the forelegs. The hair on the hindquarters is shorter. The color and character of the bison’s fur varies with the season. The calves have reddish-brown fur and do not have the conspicuous hump. Bison have a keen sense of smell and hearing, they can distinguish smells from as far as 3 km away. The endangered wild bison were returned to Colorado’s Front Range, after more than a century of its disappearance. In an enclosed 1,400 acre section of a wildlife refuge, that was once the Rocky Mountain Arsenal, sixteen buffalo brought from the National Bison Range in northwestern Montana were released on Saturday. The 17,000-acre arsenal is being transformed from a chemical weapons and pesticide manufacturing center into the Rocky Mountain Arsenal National Wildlife Refuge, after necessary cleaning. The refuge is already home to hundreds of other species that include deer and bald eagles. It was estimated that there were forty million bison in the year 1800. All of them were so thoroughly annihilated by the settlers that, by 1883, there were no wild bison in the United States of America. 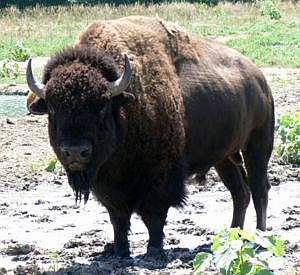 By the turn of the twentieth century there were less than six hundred bison left in North America. Fortunately, a small, devoted group of conservationists saved a few hundred bison. But for their efforts in breeding them there would have been no bison around today and they would have vanished forever like the dodos. Fish and Wildlife, the agency that brought in the buffalo manages bison on seven refuges. More bison might be relocated to the site if the first herd thrives, the agency said.